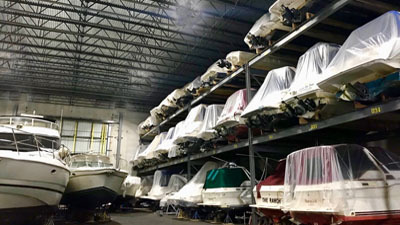 Sunset Bay Marina is one of the largest marinas to offer indoor and outdoor boat storage in the Chicago region. Our marina has a spacious 48,000 square foot, pre-cast indoor heated storage building with racking. Sunset Bay Marina is 10 acres strong and has many outdoor storage spaces. We offer shrinkwrapping to protect your boat from the elements. In addition, we have 24 -hour state-of-the-art security surveillance cameras to ensure you that your boat is safe and sound. Sunset Bay Marina is conveniently located along the Calumet River at 13620 S. Hoxie Avenue, just south of the Thomas O’Brien Locks. Boaters have easy access to the beautiful Lake Michigan, as well as fresh water moorage with many dock options. Customers may incur fees for requesting to move their boats. You might want to move your boat for a personal preference, to access your boat or launch if other boats not launching are blocking movement. Sunset Bay Marina reserves the right to this apply charge at our discretion. 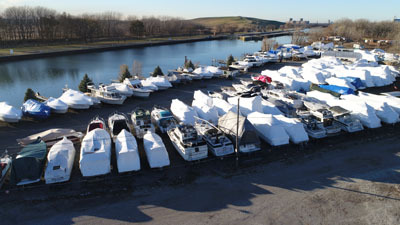 Sunset Bay Marina is one of the largest marinas to offer indoor and outdoor boat storage in the Chicago region. We offer seasonal docking, routine maintenance, fiberglass repairs, canvas and upholstery repairs, haul out and lift service, boat transportation, a fuel dock and 24-hour emergency towing. We are located at 13620 S. Hoxie Avenue, Chicago, Illinois 60633. We proudly serve the communities of Chicago, Frankfort, Flossmoor, Orland Park, Hinsdale, Western Springs, Naperville, Highland Park, Lake Forest, Wilmette, Barrington, Oak Brook, as well as other Chicago Suburbs, and Northwest Indiana. Call Sunset Bay Marina at (773) 646-9900.